The Rolex Fastnet Race is an iconic and infamous biennial race. It attracts competitors from across the globe and is widely regarded as one of the top three offshore races worldwide along with the Rolex Sydney Hobart Race and the Rolex Middle Sea Race. The Fastnet comprises of a race course of over 600nm of white knuckle racing. Setting off from Cowes, Isle of Wight, you will head southwest through the challenging and close quarters Needles Channel. From there you will head westward along the south coast of the UK negotiating the tempestuous tidal streams, passing Falmouth, the eventual finishing port of Plymouth and the iconic Bishops Rock and eventually Lands End. After the challenging transit of the Irish Sea you will slingshot the races namesake, Fastnet Rock, off southern Ireland and begin the return leg. If the weather holds true to tradition the spinnakers will be hoisted as you round the Scilly Isles and surf your way to the finish line in Plymouth where the 'apres- sail' scene is second to none. 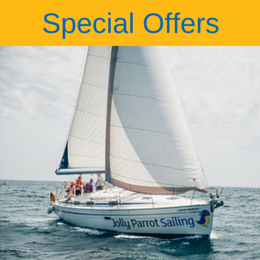 Jolly Parrot Sailing are offering a Fastnet Campaign with a twist. It is a complete package unlike any other. Beginning with a qualifying race from La Trinite, a bustling French port in the Bay of Biscay, around the Brest Peninsular, crossing the English channel to the finish line in the sailing hub of Cowes on the Isle of Wight. 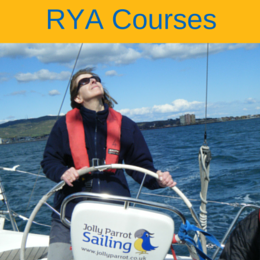 Next up, in the week prior to the start of the Fastnet proper we have a week of intense training planned, to become familiar with the yacht, crew, Skipper and fine tune the intricacies of offshore racing. Finally the main event, 600nm of adrenaline fuelled adventure, The Rolex Fastnet Race. La Trinite is serviceable by a number of regional French airports, the closest of which being Lorient. Rennes and Nantes are also close by. The public transport links from these airports to La Trinite are excellent.